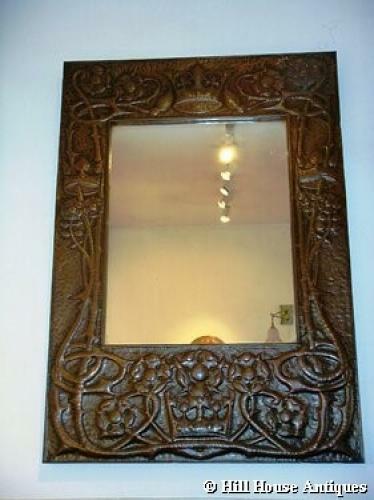 A very large, imposing and superbly executed Scottish Arts & Crafts copper framed rectangular mirror by the artist James Guthrie (1859-1930) with repousse design of crowns and roses. Guthrie, the son of a minister, originally studied law at the University of Glasgow, which he gave up in 1877 to become an artist. He was associated with the “Glasgow Boys” and became one of the most progressive Scottish 19thC painters. His works are hung at the National Portrait Gallery in London and the Glasgow Art Gallery, amongst others.